Contact Us for a No Risk Assessment! Hello. We are Michael and Cathy Stang, Centre Owners/Directors of Mathnasium of SW Calgary, your neighbourhood math-only learning centre. We help kids in grades 3-12 understand math by teaching the way that makes sense to them. Mathnasium of SW Calgary is helping students who want to Catch Up, Keep Up and Get Ahead in Math throughout the school year and summer. Our Mathletes engage in the Mathnasium method of instruction as we help them to realize their Math potential and become Math enthusiasts! Individualized Learning Plans overcome knowledge 'gaps' required to re-establish student confidence in math. Please read our article posted under the Promotions Tab. Want to sort out those 'issues' in Math and get ahead; visit Mathnasium of SW Calgary for your No Risk Assessment. Please stop by and visit the Math Learning Centre. Mathnasium has been life changing for our daughter. She has steadily been improving her math skills and her confidence and self esteem are soaring. She is also happier all around without math stress. My daughter is in Senior High and there is no Math question too difficult for Michael to solve. He’s able to explain Mathematical concepts to my daughter in a way that she understands! I already have recommended your program my daughter is excited to go to her class 3 times a week. You have made math fun for her! Attending Mathnasium for our daughter has built her confidence in Math. My child enjoys the time he spends at Mathnasium. He says it has a great atmosphere and all the instructors are very helpful. He says everyone is very patient and explains the material until he understands it completely. He said he wishes they taught all school subjects there! Mathnasium was one of the best academic decisions we have made for our kids. Both of our kids attend and we have seen a significant increase in both their marks. They both enjoy going and love the incentives that they offer. It's nice to see confidence in my once child who struggles with math and the other child is challenged more. Thanks to Michael and Cathy for this opportunity for some real math help that is consistent and reliable. Michael, Kathy and the staff have been great! So very understanding of the challenges of raising a teenager. Thanks for everything. My kids love going. They are learning so many things and progressing quickly which has given them more confidence in their school math classes. My daughter loves it, and she gains a lot of confidence in her academy at school too. This is her favorite class so far she won’t miss it so far. The class environment is very encouraging and instructional. The schedule is very flexible. I highly recommend it. Our kids are so excited to go to Mathnasium and excited to show us what they learned. Looking forward to seeing their marks go up! Mathesium team is fantastic and they have turned around my daughter’s interest and scores in maths ! The program is robust and challenges my child well so she is confident of her abilities. I have found it to bring about foundational changes. Definitely a great place to send a child who fears numbers. My daughter is very excited to attend every session. She was the one who asked for the program. I'm very excited to see the results at school. When my daughter started going to mathnasium she didn’t enjoy/like math. After we enrolled her she gained confidence and she now loves math. They are all excellent math teachers and they are also very flexible fitting the kids schedule. My son (grade 11) and daughter (grade 10) have been going to mathnasium for 3 yrs. I am very happy with the results. I cannot say enough good things about the teaching. The instructors (especially Michael) are informed, positive and encouraging. A few weeks ago, my daughter had a difficult math problem from school, which was not solved in the 1 hour time slot. Michael actually called our house later that evening, to explain the math to solve this problem! I highly recommend westsprings mathnasium. Both my kids enjoy Mathnasium. My youngest daughters repeatedly says she wishes she could go to school at Mathnasium. Very pleased. Wish there were hours available Friday, Saturday to be able to fit a third time into our week. Although hesitant at the start, our daughter runs out the door now to go Mathnasium. She is confident about math and now thinks she is good at it versus the belief that she wasn’t. We are very happy with the progress made by our child since enrolling here, he has grown more confident in tackling any Maths topic. Great experience. The teachers/helpers connect well and program has resulted is great improvements in my daughters performance. We've seen huge improvements in our daughters ability to problem solve and her confidence level has also increased. So happy with this program and would gladly recommend it to anyone needing help with Math. Outstanding Staff who know how to administer an outstanding program. Thank you for all you've done with the kids. A wonderful experience and very professional and helpful staff members. Everything is great at this Mathnaaium branch. Mathnasium has been a life saver as I was deeply concerned about the work being done at school and the ensuing frustration from not having a solid foundation of the basics. Mathnasium has given my kids the skills and confidence to attack any math problem that comes their way both in a text book and in a practical real life situation. It has given them the building blocks they need to continue growing their math knowledge without missing any critical piece of the equation. We are so grateful for this program! My son's math average increased 10% in the first month after joining Mathnasium. He is thrilled with the help he is getting from the tutors there. My son is loving Mathnasium. He looks forward to going and I have seen confidence in his math skills the short time he’s been there! Glad there is a program out there like this!!! Our son's marks have improved. Even more so, his confidence in understanding the material increased. We are very happy with Mathnasium. Our son is enjoying math and progressing so well. the program works, and the owners have very open communication. have recommended to many friends. Our daughter was very nervous to start last week. After her first session, she came out very happy, said that math was actually fun, and was excited for her next class. Michael and Cathy are so easy to work with. My daughter has found her confidence in math. She enjoys going to her sessions and doesn't want to miss. Mathnasium has been a great experience from the first contact. My children love going to Mathnasium. They always want to go and are happy when I pick them up. They have both told me they feel like they are learning more at mathnasium than at school and feel more confident in what they are learning and can see their progress more than at school. The confidence my daughter has gained with a short time at the centre is remarkable. My daughter has shown great improvement in her math marks over the last 6 months! Awesome team that motivates and teach kids maths with a lot of positive reinforcement. Great instructors and learning atmosphere! Highly recommended to all kids. After just a month of Mathnasium, my DD has taken on a renewed interest in math, does not seem intimidated by numbers and looks forward her Mathnasium sessions! I have a good feeling about how she will handle math this year in grade 5. She will have the confidence, tools and most importantly, the support she will need to do well. Thank you! I saw my child's confidence with approaching math challenges improve in just a couple weeks! We have been with Mathnasium for 3 months and the confidence towards math that my daughter has gained is amazing. It has been a good fit for us and I am happy to see the connection she has with the teachers. Our daughter loves to attend her sessions at mathnasium..she looks forward to her time spent and the Centre and aways leaves with a smile on her face. It has been encouraging to see a new found love of learning math blossom in her. Our daughter looks forward to going to Mathnasium. She loves learning in this empowering atmosphere. It was a great decision for us to join. So far so good. We haven't been going long but my kids are enjoying it and seeing results! Great program. Lots of attention for each child. Good motivation for kids. Caring people who know what they are doing. Thank you! In such a short period of time we are seeing great results in our sons progress in math. Cathy and Michael make the Mathnasium a fun experience to learn and our son can’t get enough of it. Cathy and Michael are also very quick to respond to emails and are very accommodating in scheduling and rescheduling. 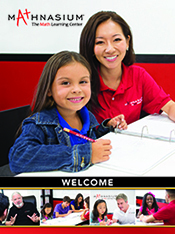 Mathnasium has been the "difference maker" for my daughter. She approaches math differently now, she feels empowered and prepared. Mathnasium has supported her for almost a year now and we will keep going. We are so happy with our experience. We have recommended Mathnasium to other family members who have chosen to enrol. Michael, Cathy, Paige and the rest of the team are simply exceptional. Mathnasium has given our daughter great confidence. The people are really nice and she enjoys going. She's still working through her issues but is loving being in the program! In only one month our son has shown an increase in confidence and is feeling increased success at school. Mathnasium is a motivating environment for him and he is eager to participate and seems engaged for the full hour. Providing extra support outside of our home seems to allow for more productivity and keeps learning a positive experience for everyone involved. I'm definitely happy as my son Vince is doing really great. Been telling my friends that they need to put their kids in mathnasium as well to be able to stimulate their talents in math and be able to do Math the best way a kid can. My son is soooooooo crazy about it now and been wishing to do Mathnasium all week!!!!! Great program! Very straightforward approach for kids to understand the basics and build up from there. Our son loves going to Mathnasium and is showing an interest in math for the first time. He actually tries to solve math problems on his own now and he never did this before. We are very happy. The impact you made on our daughter was almost immediate, can't thank you enough! My daughter has gained confidence. We are very grateful that we took a chance and signed up for Mathanasium in the summer. We have observed significant improvement in our daughter's confidence and capability in math. Michael, Cathy & Paige have the patience and expertise to guide students who have fallen behind and are suffering from a lack of self esteem to find their inner math genius! Mackenzie never complains about going to Mathnasium and is very happy with her progress in math. This has been a great environment for leaning. This is the 1st time we have seen her excited about math. This has been a great environment for leaning. This is the 1st time we have seen her excited about math. Mathnasium has really helped my son strengthen his math skills. He is more confident in math now that he better understands the concepts and is acing his exams. My son never complains about going to the sessions because he has seen the positive results for himself. The return on investing in my son’s math skills has been great and worth every penny. It's too early to give comments.but good thing is now my daughter likes the math. Our daughter is finally feeling confident with her math skills. She is making huge progress! I like that they work on 3 different topics at once to keep it interesting. Some take home worksheet would be even better. Cathy and Michael are great. Sebastian has nothing but great things to say about them! He still enjoys going, never any complaints when it's time. The new school year is underway, can't wait to see his first math evaluations and test results. Thank you! Our Daughter is really enjoying her time at Mathnasium. She is gaining more confidence every day and she improving in her math skills every session. So far we are very pleased with your program as it has built confidence and passion in our kids related to their math skills. It will be interesting to see how the program contributes to our children's school learning experience in the fall. This has made a world of difference in my daughter's math learning. It really is working for her. The people are great and knowledgeable, I see improvement in my daughter performance and desire to go to Mathnasium and study. My son loves Mathnasium and has already greatly improved his math skills after only one month! Problem of the Week for April 21st to April 25th! Problem of the Week for April 14th to April 18th! Problem of the Week for April 7th to April 11th!